Since its launch in 2014, the Pen-tek optical lens cleaning tool has been hugely popular. Small and lightweight, this pen-shaped cleaning tool with its 3 interchangeable tips is easy to use and fits in every bag or pocket. A unique non-liquid cleaning element (designed to never dry out) removes fingerprint, dust and debris, without damaging the lens surface, and leaves the lens crystal clear. Pen-tek is perfect for cleaning all optical lenses - on microscopes, laboratory equipment, cameras, binoculars, eyepieces and also watches, mobile phones and tablets. With a specially designed flat and round micro-tip, MicroPen-tek applies the invisible carbon compound to places its bigger brother can’t get to, making it the ideal tool for cleaning small LCD displays and micro camera lenses. 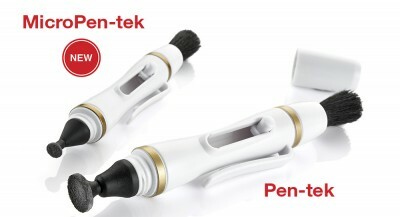 For more detailed product information please read the Pen-tek & MicroPen-tek leaflet .